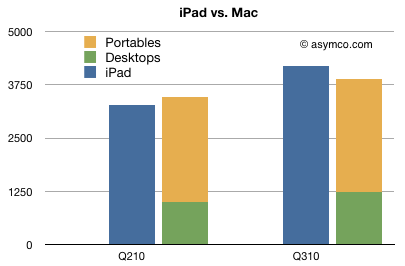 The following chart shows how the iPad has outsold the Mac the past quarter. The iPad was on the market for six months while the Mac has been for sale for 322 months–a shocking achievement. But the Mac has not slowed down. It grew faster than the overall PC market (units grew at 27.3% and revenues grew at 22%) as it has grown for most of the past 18 quarters. The performance is also highlighted in the following chart showing the history of the Mac units by quarter over nearly five years. The Mac had a slowdown during the recession but the dip in growth in the last quarter does not seem significant.